Okay now! So as promised, I am back with part two of todays projects! Oh so much fun!! However, I’m going to keep this one short and simple!! 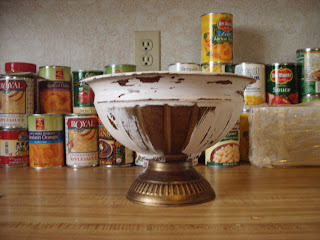 So I'm sharing another great Thrift store find, lightweight metal’ish, tin kinda, cute bones Pedestal container..99cents!! Shut your Mouth! I swear to you, all I could see when I looked at this was it painted White with some beautiful little pink blooms planted in it!! Friends, I was so excited, I completely forgot to take a before picture. 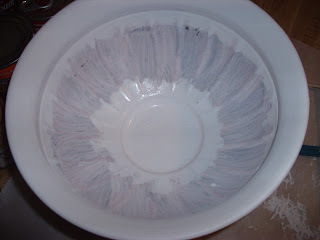 As you can see I had already started painting it when I remembered. At least you get an idea of what it was. So, 2 coats of my Behr sample size chalk paint, under $3.00 now when you order it online through Home Depot!! A hammer and a nail to put 3 drainholes in the bottom of it. (Otherwise your plant's roots will rott and your plants die) New knowledge to me! I grabbed this cute little Carnation and a couple Impatients from a six pack I had and dog gone it doesn’t it just look like that was exactly what it was made for? I had a blast doing this!! Just sharing the steps with you, so you can pick up a 99 cent special, too, and make it into something special for you!! If you haven't already, Please take a minute to go over and "Like" my facebook page... Lots more pictures from all the projects there!! Thank you for joining me and Many Blessings to you all!! Okay! This is cute, too! Wouldn't have thought of this idea! I probably would have put fake flowers back in it. Sad, I know... which is why it was meant for you! I'm with you Leslie, I wouldn't have thought of this either, but it looks amazing. Hey, Kathryn, Thanks so much for your kind words and hopping over!! Super cute :) Thanks for linking up at Feathered Nest Friday! Thanks for Hosting, Courtney! I always love coming back to your page to see what you've been up to..I;m glad you liked it! Thank you so much for you very kind words and hopping on over to this project!! I am so glad that you shared your talent with us at The "Sunday Stop" Party! I love to spend close to nothing and have something BIG to show for it and you certainly did just that in this pot!!! I did not know that about the roots needing drainage so thank you for the info as well. Hugs and have a great Sunday! Thanks Bj!! I'm so glad you liked them!! Thanks for hosting the Party! Yeah, like I said, just found that info about the roots recently...Needed to know, before I killed anymore plants..Haha..
Every bit as cute as I bet you imagined it. What a great idea for those great deals on ugly old containers. I didn't know there was a Behr chalk paint. Do they sell it in the stores at all, do you know? Found your post at Joy 2 Journey. I'm following you now. I hope you'll stop over for a visit to Quirky Vistas when you have time and follow as well. Thanks, Liz!! No they don't sell it any of the stores only on-line. Even then they don't call it Chalkpaint. You have to look under paint samples "chalk" and then you've got it!! I was very lucky to have found it! I'll definitely pop over to Quirky Vistas to check it out!! Thanks again! Thanks for coming by and for taking the time to say hello and follow! You totally refreshed it and gave it a new life. Very cute! Great makeover! You made it pretty all over again! Perfect! And Beautiful! And very very thrifty, lol! mean more than you'll ever know to me!! Thank you and Many Blessing to you all! I love your shoestring mentality. Such a pretty planter for very little money! I hope you will share this on TUTORIAL TIPS AND TIDBITS!!! Sa-weet Find! I love thrift shopping too! Love the after! Isn't it amazing what a coat or 2 of paint will do to transform an object? Thanks so much for sharing on Tout It Tuesday! Hope to see you next week. I love it! And the flowers look great! Thanks for sharing at the All Star Block Party. Love this idea!! Come link up to Centerpiece Wednesday and share you idea with us! Thanks for the invitation Karin!!! All linked up!! I appreciate all the beautiful comments here!! YOU ARE ALL SO INCREDIBLY WONDERFUL TO ME!!!! With all my heart, I thank you and pray you all Many Blessings! You are too kind :) Have a great day. It did turn out beautiful and the flowers are a perfect match. 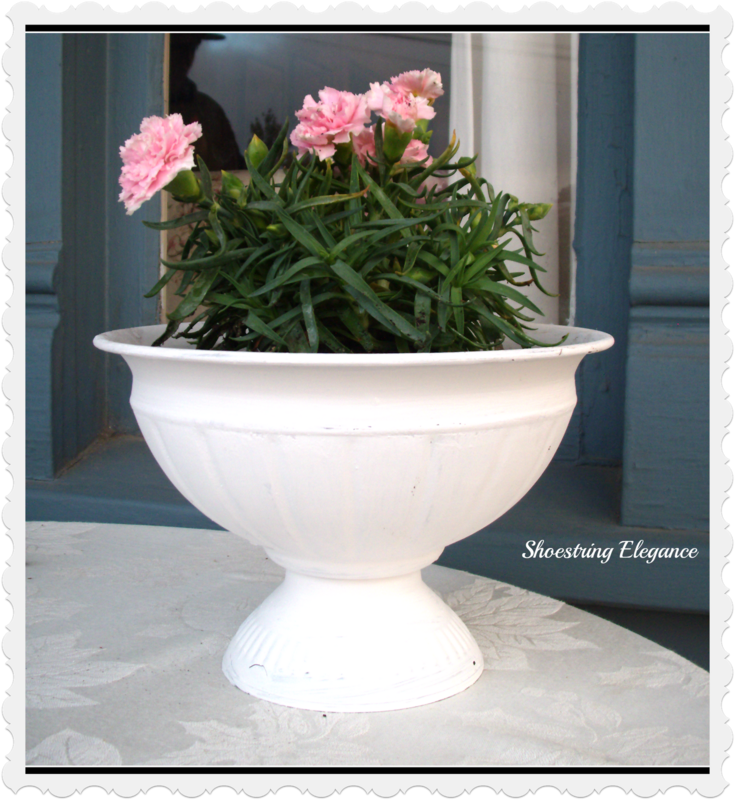 I love this planter... it looks fantastic!!!! You are so clever! 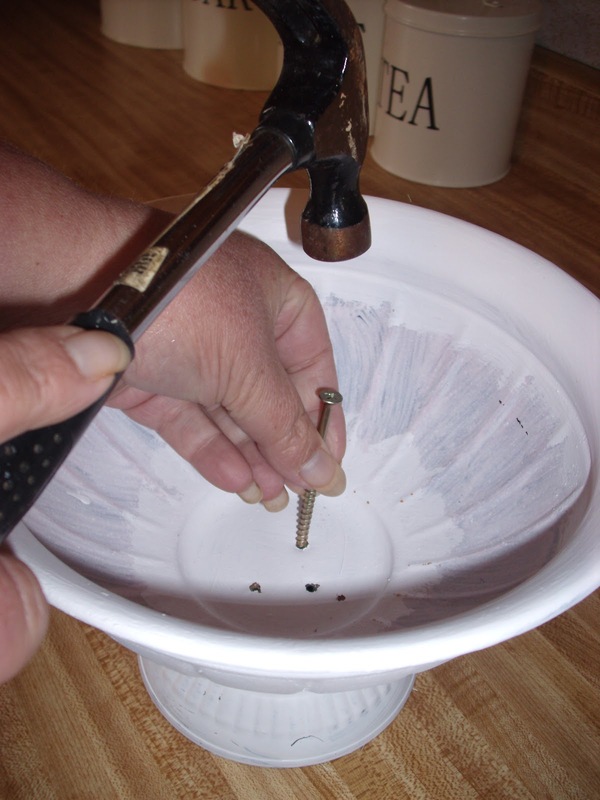 That is a great tip about adding the holes at the bottom too-I didn't know that! Thanks so much for sharing this post at my Say G'day linky party! Thanks also for adding my button to your sidebar-I really appreciate it! This week's linky is now live and I am very excited to invite you to a Social media linky party that I will be hosting on July 14. The details are all at the blog if you would like to join in. PS I just gave this post a +1 on Google +! It takes a good eye to see the potential! Turned out well and the pink flowers are perfect for it! Thanks so much for sharing on Busy Monday at A Pinch of Joy. Hope to see you again soon! I love this, and absolutely love the price (my kind of shopping)! Your project turned out ADORABLE! Thanks for sharing the tidbit about the roots rotting as well...I knew that drainage was needed, but I didn't know that particular bit...so THANKS!!! Thanks for linking up with us @ Toot Your Horn Tuesday as well, and looking forward to what you share with us next! Thanks so much for joining the French party! Come back on Mondays!